Solo, with strangers, with friends, on new trails and old routes, from the front door and abroad, to work and back again, on a road bike, mountain bike, Dutch bike, quick spins and epic rides, in sunshine, rain, hail, snow, ice and plenty of mud, these have been my rides this year, which is my third year of Project Snail – trying to have more fun on my bikes and in particular to increase my skill, confidence and fitness through mountain biking. I’ve definitely ridden a lot this year, regularly commuting and then getting out most weeks on the mountain bike as well. Our regular weekly evening rides have been a god send, demonstrating how you can fit riding into a busy work/ life balance arrangement and it has kept me riding with people who are much better than me. Their encouragement has meant that I think I am slowly improving. It’s really hard to tell as confidence and perceived lack of skill remain rather large issues for me, but judging by how I ride some of the sections locally I definitely think things are on the up. I must remember that it apparently takes 10,000 hours before you become a master so I’ve got a bit of work to do yet. 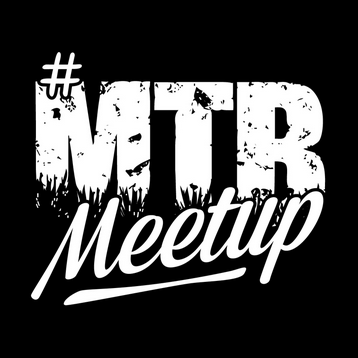 I’ve thoroughly enjoyed some of my trips to North Wales this year, #MTBMeetUP was a great weekend ,I’ve I returned to ride Llandegla a few times and we’ve had some great weekends crashing in bunkhouses and doing Penmachmo, Marin etc. Getting round these as well as some of the more challenging local riding has definitely helped and I look forward to more in 2016. One day I’ll find the flow. As well as riding it’s been good to take in the Tour of Yorkshire and the Nationals in Lincoln and I launched the Leeds Bicycle Film Club showing monthly bike related films and documentaries that has been good fun and has sold out every event so it would appear that I’m not the only one who likes a beer and a bike related film. I’ve got a good programme lined up for 2016 so grab yourself a ticket and come along. For me more than anything though I love the social side of riding and I’ve ridden with some ace people this year, my heartfelt thanks goes out to all of you, look forward to more pedals out across the New Year. Cheers. Social media, a bit like the news or politicians gets a bad press – usually I think because we seem for some strange reason to be drawn to the negative in many things. So social media when it hits the headlines is usually because of people using it to do bad things, rarely do you hear it as a force for good but that in my experience is very much what it is. It enables you to spread ideas, entertain, inform, bring people together and coalesce them around an interest or idea. That bringing together can be done virtually but it can also be a physical thing. On the weekend Si Bradley (@_Si-Bradley) used that very concept and a simple hashtag to bring mountain bikers from around the country together, not to race or be competitive but to share, to meet, to socialise, to eat, to drink and to enjoy the simple pleasure that riding a bike off road can bring, irrespective of your skill or experience. Myself, Rob (@chasinsheepMTB) and Brian (@oldstuntmonkey) left Leeds very early and got down to Llandegla for 9am to find scores of mountain bikers of every hue milling about and chatting doing that awkward thing of trying to introduce yourself to someone who may only know you via a twitter name …. i.e. hello I’m yetiridingdragon or whatever. Amazingly the sun was out (I know it’s always sunny in Wales isn’t it) and with charity raffle tickets bought and a brew drunk with the mornings riding began. Si had organised a great range of options for people to do if they wanted to or they could just do their own thing and people had kindly given up their time to pass on skills or lead rides. Groups of riders headed out to ride the Blue, Red or Black runs, Craig (@P9ADV) ran a kids ride, Trail Takeover led a women’s ride, Chris (@CMJDavies) led an adventure photography workshop and I went on a skills session delivered by Steve from (@chasingtrails). All of these people kindly gave up their time and skills for free. 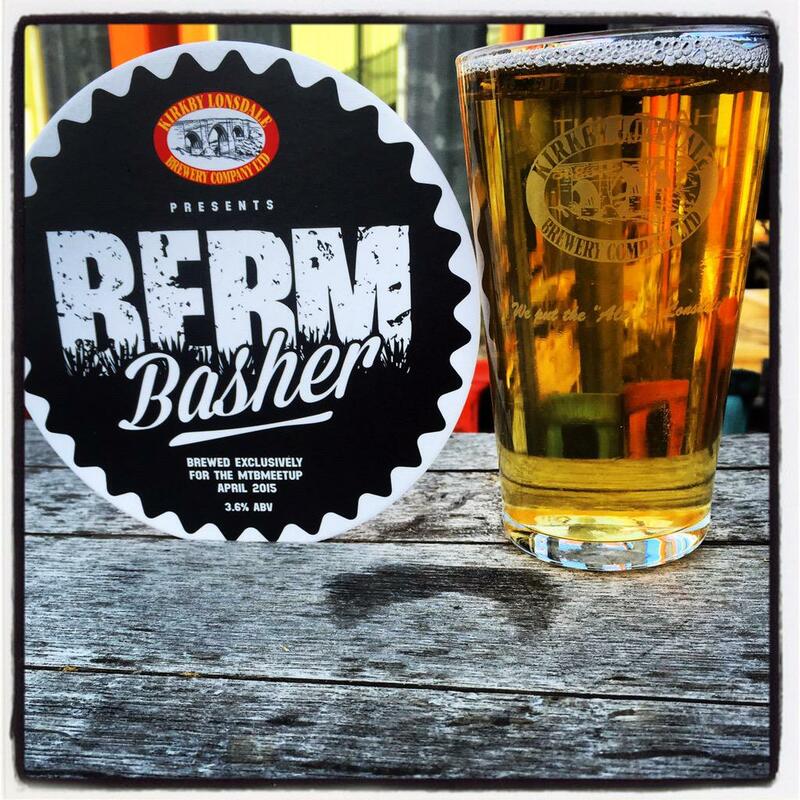 Talking of free after the morning session the fab guys from Kirby Lonsdale brewery were handing out their specially produced Berm Basher beer. Happy days indeed. In the afternoon I headed out with Rob and Bri to have a crack at the red run and see if I could put my new found skills into action. I was a tad nervous as I always am but I got round in a reasonably ok fashion I think. Slowly my projectsnail confidence and skills are improving. 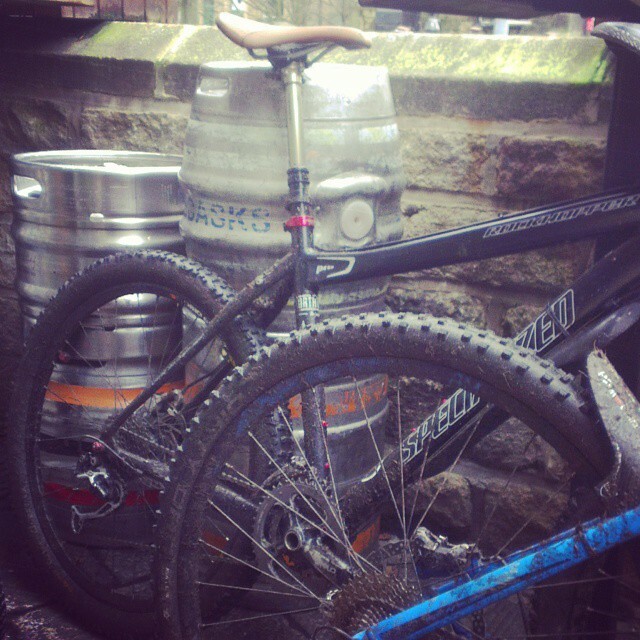 The beautiful day was finished with tea and cake provided by (@puremountains) and of course a bit more beer. Could a day get any better ? What I really liked about it was that there was none of the macho radness that can sometimes infect the MTB world, an attitude I detest. The atmosphere was really chilled people rode, passed on skills, shared the trails and the tales and a good time was had by all. Huge thanks must go to Si and all the helpers and sponsors for making it such a great day. Si had even organised us a great campsite (Llyn Rhys Campsite) so we stayed over and rode the trails again on the Sunday before heading wearily and happily home. So anyone who knocks twitter again – ignore the naysayers there are good people out there using social media to bring people together to share good times. 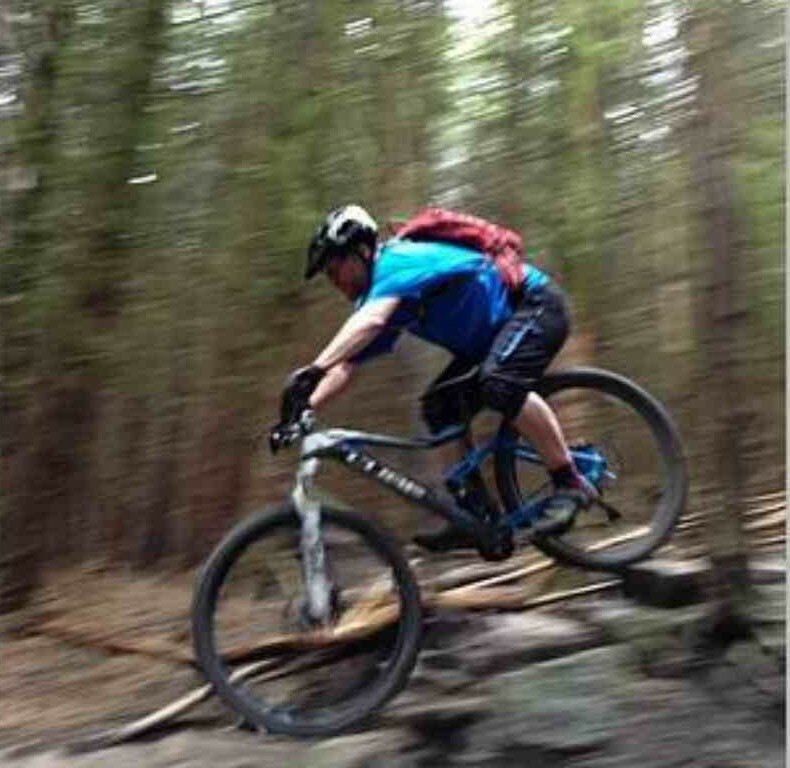 As I talked about in this post one of the great things about mountain biking is that it is fairly unique I think in enabling people of different abilities to ride together and for everyone to get a lot of enjoyment out of it. Nothing perhaps epitomises this spirit more than The Shop Ride. Garage Bikes, my local bike shop is particularly brilliant at organising regular shop rides and huge thanks must go to Al and Sarah for doing this. Once a month a motley crew begins to gather on a Sunday morning, I was one of the first at the shop yesterday and it was ace to watch the riders arrive in ones, twos and small groups until a pretty impressive collection of bikes and riders of all hues was arrayed outside the shop gathering bemused looks for the passing traffic and pedestrians. As is always the way some riders I knew, others I’d seen but didn’t know and for some it was their first ride with the Garage Bikes crew. The brilliant thing is though all are welcome, it’s a very social ride supported brilliantly by the shop, the staff ride (unless they are racing) and guide and support all comers around our local trails. The atmosphere is always good and outside newcomers were made to feel welcome and all were chatting away and engaging in the MTB ritual otherwise known as the pre-ride faff ! and with so many riders there was some serious faffing to be done. 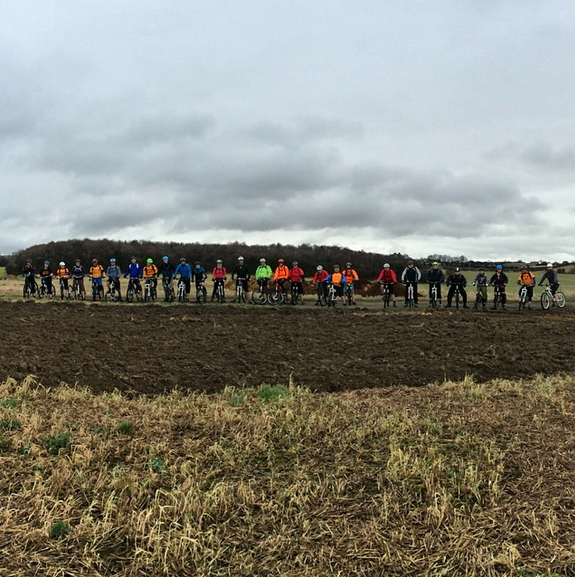 29 riders pitched up yesterday in the drizzle, which was on top of the ladies ride on the Saturday which also gets a good turnout and as we set off we looked like some ragged bright baggy peloton. As we ride along I like how you can chat, get to know new people move up and down the group or just peddle along in your own thoughts but surrounded by like minded people. We ride at an easy pace and someone rides sweeper to ensure that we all meet up at various points. Back at the shop we all pack in for steaming mugs of coffee, tea, biscuits, rum and banter. 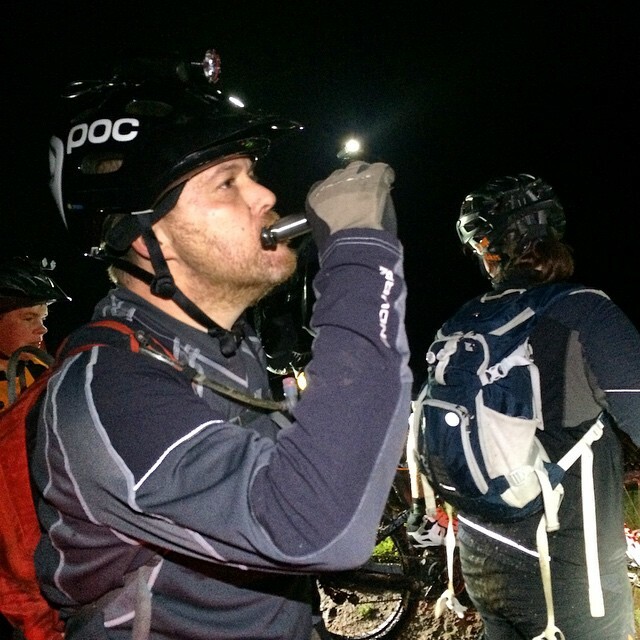 The shop ride is a magical thing for me, the very essence of community and what is great about MTBing and MTB riders, friendships are made and groups spin off from the ride to organise other get-togethers and adventures. The people I’ve met through the shop rides and the riding that has resulted has hugely improved me as a rider and really enhanced my whole riding experience so I’d like to say a big thanks to the good ship Garage Bikes and all who sail in her. Today was an amazing experience riding with some great people, the weather was incredible for a winters day, bright blue sky’s with a low retina burning sun but it was still very cold and as we climbed onto the moor tops there was solid ice, snow and freezing fog that rolled in. It was one of those classic British Mountain Biking days, and we had more wardrobe changes than a fashion show as layers came on and off as the temperature and conditions fluctuated wildly. The were some highly technical (for) me sections on the ride that I took immense pleasure from just about riding although my fragile confidence did take a knock in places. However what I thought about as we were riding round is how unique mountain biking is as an activity in terms of the enjoyment you can get riding with people of different ability. The people that I was riding with today are miles better riders than me but we all thoroughly enjoyed ourselves in a way that I don’t think is possible in any other sport. If I was playing tennis for example against someone really good then it would be a very dull experience however on a mountain bike that all changes. You can ride along together chatting, laughing and chewing the fat and then if you get to a more technical or quick section the better riders can take it at the pace they want picking all sorts of lines and I’ll attempt to snail my way down. We meet at the bottom all having enjoyed it equally in our own way and then ride on together to the next bit. As always we finish at a pub for a pint chatting over the ride and the fun we’ve had, no matter the difference in our abilities the smiles are the same. I’m now two years into my Project Snail idea, which in a nutshell, was to have more fun on my bikes and to do this by trying to improve my fitness, skill and confidence – all of which when I looked at myself I realised were areas where I was lacking quite a bit. At this point last year I looked back over my first year and realised I had moved on quite a bit through a combination of riding more, riding with different people in different places and having some coaching from the marvellous Ed Oxley. This year has very much carried on in the same vein and whilst I still have pretty major confidence issues I do feel like I’m improving slowly and I have definitely had a huge amount of fun over the year which is the whole point for me of riding my bikes. As well as simply trying to ride as many days as I can, which hugely helps on the fitness front – little and often, I actually bought myself a proper full suspension bike which has brought me endless smiles, I simply love it. It was great to have another session with Ed shortly after I bought it when the picture at the top was taken. That section was a classic for me, I looked at it and bottled it numerous times but with Ed’s gentle encouragement I finally made it and I actually look like a proper rider I think on that photo. Later on in the day we rode the section at the end of a run with Ed following me down, as we approached he veered off on another route whooping through the woods and when we got to the bottom he just said I knew you were going to be fine and would ride it so left you to it. It was one of many small steps I took during the year each one of which, while nothing for many people, filled me with a huge sense of achievement. I also rode in a couple of events, the Morvelo City Cross in Leeds which was huge fun and attempted to ride up a steep hill which was quite frankly silly and fun at the same time. Although it did not involve riding I did put on an event which combined books and cycling with a couple of authors coming to talk about their adventures. Having never done anything like this before I was worried it would be a shambles but it actually turned out to be a cracking night in front of a packed house. I’ve got some ideas for some similar events this year as well. Talking of events I guess the main one was witnessing the Tour de France take place in Yorkshire a weekend that will live long in the memory. Seeing all the events that took place around the tour as part of the Yorkshire Festival and seeing different people on bikes in and around Leeds on a daily basis I’ve set up Leeds Rides which aims to show the human side of cycling in the city. I’m hoping to try and get a thousand people on it in 2015 and then have a bit of an exhibition and a party. 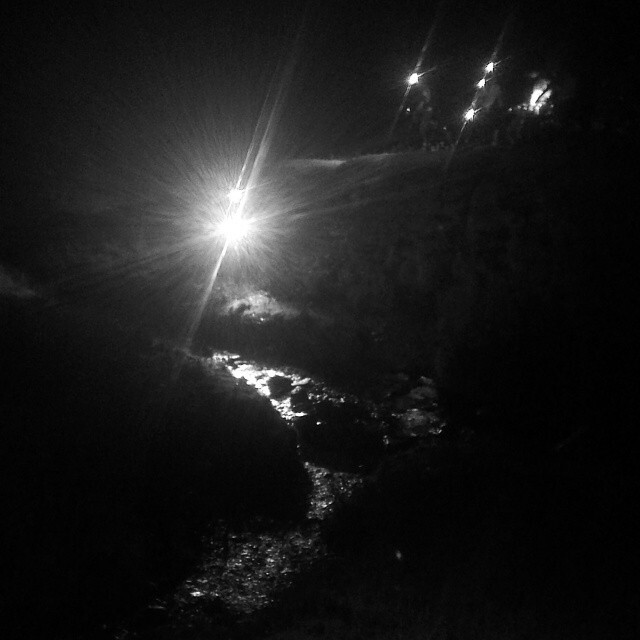 Perhaps the most exhilarating step I took this year was to venture into night riding, something that genuinely terrified me but which is something that I have hugely enjoyed doing and which created some amazing memories and pictures. It also enabled me to ride much more over the winter which I’m hoping will pay dividends as the weather and the light improves and will have helped me considerably on the Project Snail plan. Without doubt though the most important thing for me in my riding has been the people who I’ve ridden with who have helped, coached and cajoled me along. Thanks to all of you it’s been genuinely humbling and loads of fun. There are too many to mention in person but the Garage Bikes community in particular are a special group of people and riders who are great to be around and who make my world a better place. I’m not a competitive person on a bike, for me it’s all about the social side of things, riding, having a chat and finishing with a beer (or occasionally having a cheeky swig from a hip flask on the ride) and this side of things has been the real highlight of the year for me. The day before yesterday was a classic case in point, 3 of us on an amazing ride around Hebden Bridge, me out of my comfort zone but being encouraged by better riders, all of us enjoying one of the best rides of the year chewing the fat as we rode and finishing with a cracking pint. If I have more rides like that in 2015 I’ll be very happy indeed. Rob finished the the ride and tweeted the following. I still think Project Snail is ongoing but who knows maybe I need a new nickname. Any ideas ? After @ianstreet67 pulled my legs off on the climb out of Hebden, and nailed Blue Pig, I declare, the Snail is dead, long live the Snail! 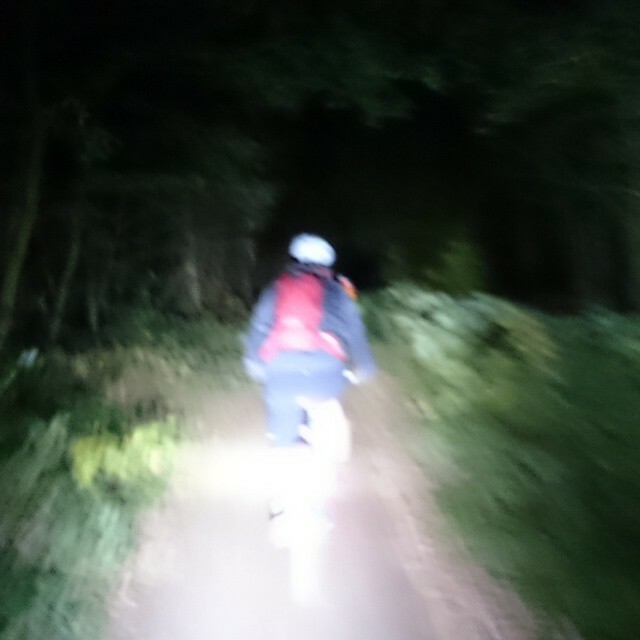 I’d heard that people went off road riding in the dark and while the idea intrigued me I was also bewildered by it. How did they do that, after all I can barely work out what I’m doing in the daytime when I’m aware of my surroundings and can see stuff. However as we slid into autumn I began to think whether I could do it, as if I could, it would add a lot to my riding and enable me to keep riding through the winter in the evenings and ideally most importantly having fun. Over the last few weeks I have taken the plunge and it has in many ways changed how I think about riding while at the same time it’s been some of the most enjoyable riding I’ve done. I still feel nervous when we are getting ready in a car park or lay-by surrounding by the all enveloping blackness as I still suffer from a lack of confidence in many respects, however night riding is perhaps perversely doing more for my confidence than anything else. 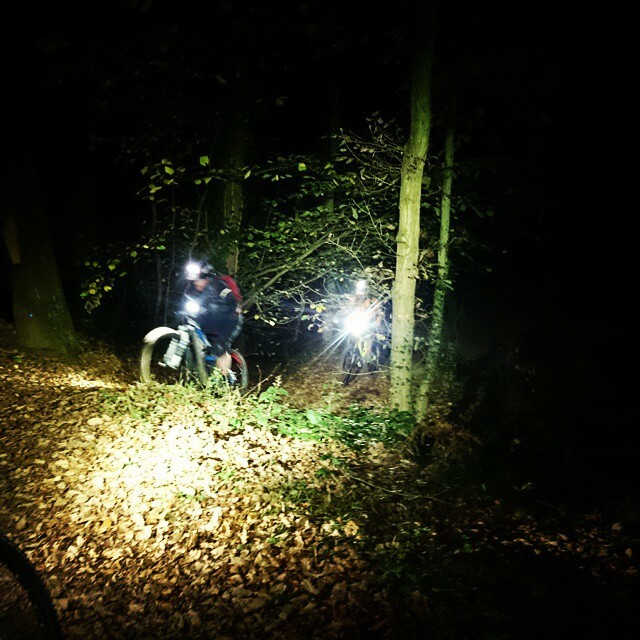 Lighting is obviously key enabling you to confidently strike out into the dark and once you get them set up right you create your own personal projected halo of light into which you ride. The first thing I noticed as I tentatively pedalled into the abyss was that yes it is possible, the lights designed for MTB night riding really do their job, and you soon start to get used to the change in your visual panorama and I think it’s a change that has the potential to improve me as a rider. In the sessions I’ve done with Ed one of the real things that Ed works on is Chin Up – i.e. you need to be looking where you wish to go not at the ground under your wheel. You are completely forced to look up at where you want to go, to shine the light on your helmet in that direction and then let the bike flow into the pool of light. As I’ve got used to it and adjusted I have found it a hugely liberating experience. One of the best things about mountain biking for me is the immersion into the landscape and how you experience it throughout the changing seasons, the smells, colours and textures providing an ever shifting backdrop to your movement. Night riding takes this to another level again. On the one hand you are surrounded by utter inky blackness but this darkness magnifies your senses and your movement through the trees in a small tunnel of light takes on a magical quality, leaves crunch, breath clouds out around you, chilled facial skin breaks through dewy cobwebs, free wheels clacking and echoing around the still woods like a pack of new animals moving in. It’s utterly exhilarating and intoxicating. Riding along the flat stretches between runs finds me totally unwinding from whatever I’ve gone through during the day and there is a feeling that you and your mates are the last people left on earth even though you are only a couple of miles from the pub. If you’re lucky one of those mates will have packed a hip flask to warm the belly before the last run back down to civilisation. Ride 400 metres up a street, how hard can that be? Very as it turned out when the street in question is insanely steep and cobbled. 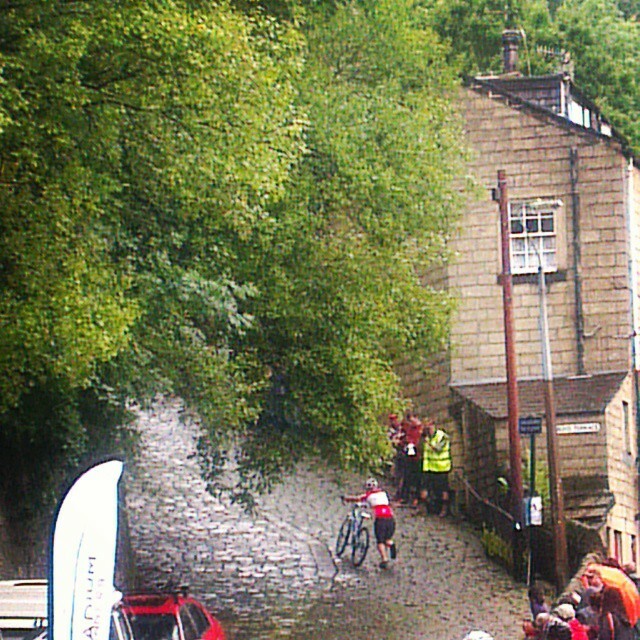 Saturday saw me and Rob (@chasinsheepMTB) head over to Hebden Bridge for the Up The Buttress challenge, a timed hill climb up the steepest ‘road’ in the town. Now anyone who has ridden over in that valley knows that it is steep sided and makes for challenging riding, whether that be on or off road but this street took things to a whole other level. I don’t know how steep it is but people milling about the registration tent were saying it varied from 1 in 3 to 1 in 5. We had no chance to think much about it as after paying our fee we were lining up ready to roll, I had no idea what I was facing as you could only see the start of it from where we were to set off and that looked like a wall. There was much talk of tyres and tyre pressure and what was the ‘best’ style of bike to get up it. There were all sorts, hardtails, full suspension, blinged out cross bikes, old clunkers and one dude having a crack while attempting to tow his daughter in a trailer ! All ages were present and it had a feel of a really inclusive event – young or old, good or bad just have a go which exactly as I like it and it should be and everyone no matter the ability was cheered, encouraged and cowbelled up the slope. To add to the air of inclusiveness anyone who got to the top, no matter how you did it, got entered into a prize draw and there were some amazing prizes including a bike from Orange ! As I got ready to go Chipps from the Singletrack crew felt my tyres, “any good?” says I, “you’ll see” was his reply with a knowing look in his eye. Oh dear. I didn’t bother thinking about trying to charge into the bottom of the slope, I thought I’ll just roll to it in bottom gear and then spin away. I’ve recently ridden up some very steep stuff so I thought I’d be OK but I’d not factored the slippery cobbles into my equation. As the wall hit and I started to peddle I thought to myself, yep I can do this and inched up the steepest part of the hill but then just before a lip across the path all my wheels were spinning like something out of the road runner cartoon and I ground to a halt. Jumped off and pushed for a bit then tried to get going again which was a lot harder than it should have been as just could not get any purchase. Finally got moving and felt OK (well that I was not going to die anyway) and plodded slowly along until the inevitable spinning of wheels hit again and I ground to a halt again. I seemed to be now standing on glass as I was actually struggling to stand still but I could not get the wheels to get any grip so resorted to pushing up the hill in a comedy slip / sliding about fashion. As I neared the top the shouts of encouragement rained down but I could not have moved any faster if Genghis Khan’s Mongol hordes had been behind me. Crossing the line I realised that at least there were some others who had slipped about, Rob however had no problems right tyre choice and running at an insanely low pressure meant he didn’t slip once, that and he’s a great rider of course. 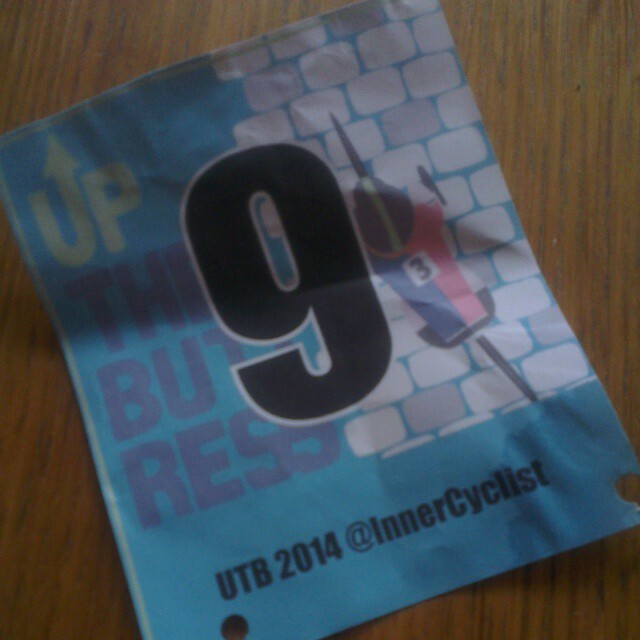 We encouraged a few riders up, got our breath back and then headed down the road to the pub for a few beers before going back to see the winners receive their fantastic prizes – a massive cobble a la Paris-Roubaix and see what our lucky numbers got us in the raffle. Rob got a bottle of beer whereas I got a fantastic Timothy Taylor’s cycling jersey. Sometimes it pays to be the snail.